This article is about the film director. For similar names, see Joseph Johnston (disambiguation). Joseph Eggleston Johnston II (born May 13, 1950) is an American film director and former effects artist best known for such effects-driven movies as Honey, I Shrunk the Kids (1989), Jumanji (1995) and Jurassic Park III (2001). These movies include a number of period films such as The Rocketeer (1991), The Wolfman (2010), and Captain America: The First Avenger (2011). Johnston also directed the biographical drama October Sky (1999). Johnston at the 2010 San Diego Comic-Con International. Johnston was born in Austin, Texas, and attended California State University, Long Beach, and Pasadena's Art Center College of Design. Much of the work at the beginning of Johnston's screen career combined design and special effects. He began his career as a concept artist and effects technician on the first Star Wars film, directed by George Lucas, and was art director on one of the effects teams for the sequel. His association with Lucas would later prove fruitful, when he became one of four to win an Academy Award for Best Visual Effects for Lucas and Steven Spielberg's film Raiders of the Lost Ark. Johnston continued to work on many films as an effects expert. He was also associate producer on fantasy Willow, and production designer on two mid-80s TV movies which featured the Ewoks seen in Return of the Jedi. Johnston is also author of Star Wars novel The Adventures of Teebo: A Tale of Magic and Suspense, which ties into Return of the Jedi (New York: Random House, 1984; ISBN 0-394-86568-5, ISBN 0-394-96568-X). In 1984, Lucas gave Johnston a sabbatical, with salary, and paid his tuition to attend the USC School of Cinematic Arts. Johnston left after a year, saying he "was asked not to return" because he "broke too many rules". Johnston made his directorial debut in 1989 with hit comedy adventure Honey, I Shrunk the Kids, starring Rick Moranis. He followed it with comic-book adaptation The Rocketeer (1991). The film was a commercial failure, as was his next, the animated and live-action The Pagemaster. Johnston rebounded, directing the family hit Jumanji, starring Robin Williams. The film overcame lukewarm reviews to gross over $260 million. Johnston was set to direct Hulk, but dropped out in July 1997. Johnston then switched gears from effects-driven action films to the more personal October Sky (1999), starring a teenage Jake Gyllenhaal as a 1950s West Virginia high school student who dreams of being a rocket scientist for NASA against his father's wishes. Johnston's first project of the 2000s was the sequel Jurassic Park III, which made over US$300 million at the box office. Johnston followed it with western Hidalgo, starring Viggo Mortensen. Johnston then took a six-year directorial break before signing on at a month's notice to take over the 2010 remake of 1941 horror classic The Wolfman. Shot in England, the film starred Benicio del Toro and Anthony Hopkins. In part thanks to his experience with the period superhero film The Rocketeer, Johnston was selected to direct Marvel Studios superhero adaptation Captain America: The First Avenger. Released on July 22, 2011, the film stars Chris Evans as the comic book hero and Hugo Weaving as his archenemy the Red Skull. In 2012, Johnston directed the thriller Not Safe for Work for Blumhouse Productions. On April 26, 2017, Variety announced that Johnston had been hired by the Mark Gordon Company to direct the fourth installment of The Chronicles of Narnia film series, originally from Walden Media, The Silver Chair. 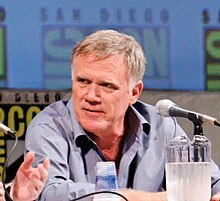 On November 4, 2017, Joe Johnston announced that The Silver Chair would be his final directorial effort. On December 12, 2017, The Hollywood Reporter reported that Johnston would helm 32 days of reshoots on the film The Nutcracker and the Four Realms due to its director Lasse Hallström being unavailable. 1985 Star Wars: Droids Yes Episode "Coby and the Starhunters"
1993 The Young Indiana Jones Chronicles Yes Episode "Princeton, February 1916"
^ Diaz, Victor. "Austin-born Oscar winner directs 'Captain America'", Austin.YNN.com, July 22, 2011. ^ Buchanan, Jason. "Film > Film Biography > Joe Johnston", AllMovie.com, n.d.
^ Joe Johnston. "''The Adventures of Teebo''". OpenLibrary.org. Retrieved January 11, 2014. ^ "2004 interview with Joe Johnston. Retrieved 12 August 2012". Articles.baltimoresun.com. March 8, 2004. Retrieved January 11, 2014. ^ "2001 ''filmschoolrejects'' website interview with Joe Johnston. Retrieved 12 August 2012". Filmschoolrejects.com. July 18, 2011. Retrieved January 11, 2014. ^ "Jumanji (1995) - Box Office Mojo". boxofficemojo.com. ^ Michael Fleming (April 14, 1997). "A Mania For Marvel". Variety. Retrieved November 10, 2008. ^ Kroll, Justin. "'Captain America' Director Joe Johnston Boards 'Narnia' Revival 'The Silver Chair'". Variety.com. Retrieved April 4, 2017. ^ Kit, Borys (December 12, 2017). "Joe Johnston to Direct Disney's 'Nutcracker and the Four Realms' Reshoots (Exclusive)". The Hollywood Reporter. Retrieved December 13, 2017. ^ Kit, Borys (July 5, 2018). "Lasse Hallstrom, Joe Johnston to Share Director Credit on 'Nutcracker and the Four Realms' (Exclusive)". The Hollywood Reporter. Retrieved July 5, 2018. ^ Foutch, Haleigh. "'Captain America' Helmer Joe Johnston to Direct 'Narnia' Revival 'The Silver Chair'". collider.com. Retrieved April 26, 2017. ^ "'The Chronicles of Narnia: The Silver Chair' update: Mark Gordon drops teasers about setting and visual effects". Wikimedia Commons has media related to Joe Johnston.